Out of the countless fashion trends in vogue, the art of body adornment is one of the rousing trends that simply make you want to go untamed in style. Body piercing and are the two-pronged hit fascinations of body art which now have the white ink tattoos as some of the new additions in the list of top fashion trends that have allured hundreds of men and women to get engraved with the cool hot look of white body patterns. It’s pretty much the hottest fashion frenzy that has created a style-mayhem amongst the wild fashion lovers that have a taste for something unique and innovative. Gaining demand and popularity day by day amidst the young generation, it’s one of the best ways to be noticed for refreshing imprints on the body that are more inspiring than the blackish gray tattoos.For summers they are some of the highly voguish style statements that flaunt ghostly impressions of thicker and better quality imaged logos and designing. The most popular white ink tattoos hot in demand include angel wings, flowers, celestial images, tribal patterns, initials, expressions etc. 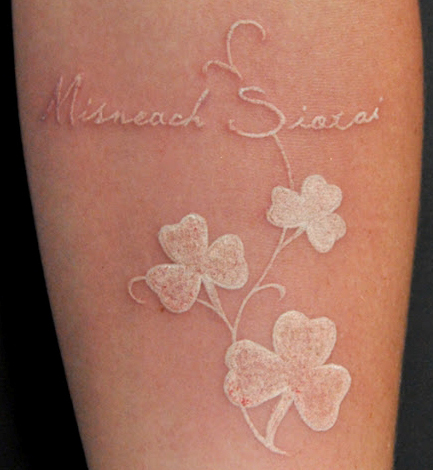 The technique of white ink tattoos’ application varies from that of the common one in practice as it does not necessarily make use of proper stenciling or outlining for clear and sharp marking, rather applies an adept open hand engraving that offers the white ink tattoos a slightly different outlook that is less fierce; rather ghostly . Since there is no concept of multi shades like that of black tattoos, the quality of white ink tattoos has an edge over the latter. For the perfect impression of white ink tattoos several re-traces are required because the white ink does not absorb into the skin as easily as the dark tattoos. However; amidst all the rage of white ink tattoos let’s not just focus on its bright and enticing outlook as there are several concerns that need attention before being opted for as the ultimate look of style. 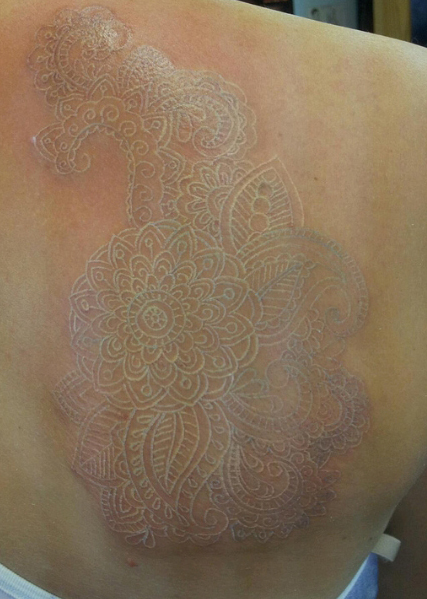 Skin reactions like swelling, itching, and oozing are some of the alarms associated with white ink tattoos. Another prime drawback is that it is not suited for exposure which is somewhat impossible because the whole idea is to flaunt the groovy imprinted designs of tattoos without which the trend stands futile; hence more chances of skin problems. Last but not the least, white ink tattoos are also vulnerable and sensitive to household chemicals and require protective clothing and vigilance to stay safe from reactions; thus tarnishing the whole fun of carrying tattoos. Nevertheless, the trend has its appeal and it’s just a matter of deciding whether you can compromise with so many concerns.